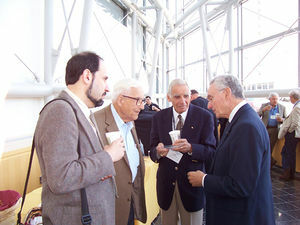 IEEE History Center Director Michael Geselowitz (left) with three past presidents of the IEEE, Arthur Stern, Henry Bachman, and Joseph Bordogna. The author, Frederik Nebeker, with Nina Borisova, Director of the Popov Central Museum of Communications in St. Petersburg, Russia. The IEEE History Center and the IEEE History Commitee organized a conference, the 2009 IEEE Conference on the History of Technical Societies. It was held from Wednesday 5 August through Friday, 7 August 2009, in Philadelphia, Penn. 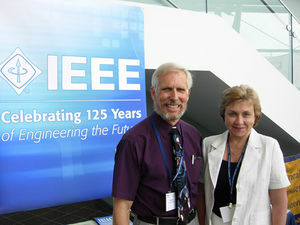 The subject of the conference was chosen in part because 2009 is the 125th anniversary of IEEE and in part because technical societies, through meetings, publications, education, and other activities, have been vital to the progress of electrical and computer technology in the past century. Joe Bordogna was honorary chair, John Meredith was conference chair, and Rik Nebeker was program chair. Some of the talks on the first day of the conference were "An Overview of 125 Years of IEEE History" by Sheldon Hochheiser of the IEEE History Center, "The Importance of the History of Technical Societies for the History of Technology," by Jonathan Coopersmith of Texas A&M University, and "Creating the IEEE Code of Ethics," by Emerson Pugh, formerly of IBM. Shoji Shinoda of Chuo University presented a historical overview of the Institute of Electronics, Information and Communication Engineers (IEICE), and Antonio Pérez Juste of the Technical University of Madrid spoke about the origins of the Spanish Association of Telecommunications Engineers (AEIT). Nina Borisova, director of a communications museum in St. Petersburg, told of the Russian experience in organizing professional societies for telecommunications. There were four talks on the technical societies for computing, and there were talks on societies for signal processing, information theory, and computational intelligence. Fumio Arakawa, of the Global Engineering Institute of Tokyo, spoke on "Remembering the Roots for the Sake of the Future.” Eiichi Ohno, Chair of the IEEE Japan Council History Committee, talked on the history of IEEE in Japan, and Bruce Barrow gave some history of IEEE in Belgium, Netherlands, and Luxembourg. At the end of the day on Wednesday there was a visit to the ENIAC Museum of the University of Pennsylvania. The ENIAC, a pioneering electronic digital computer, was built at the Moore School of Electrical Engineering from 1943 to 1946, and the museum, still housed in the Moore School, contains parts of the original machine, along with other artifacts and photographs. Professors Mitchell Marcus and Atsushi Akera, who co-wrote a historical article on the ENIAC, guided the visit to the museum. On the evening of the second day was a celebration of the IEEE anniversary with a reception and banquet at the Down Town Club, adjacent to Independence Hall in the historic district of Philadelphia. 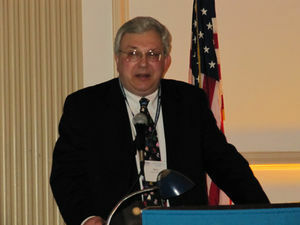 There were remarks by 2009 IEEE President John Vig and by past IEEE Presidents Joseph Bordogna and Richard Gowen. Henry Petroski, popular author and professor of both engineering and history at Duke University, gave the banquet address entitled "History and Engineering: Building Bridges Together.” A generous supporter of the conference and the banquet was the IEICE (The Institute of Electronics, Information & Communication Engineers, Japan), the official Banquet Underwriter. Generous support of the conference was also provided by two other Japanese organizations, the IEEJ (The Institute of Electrical Engineers of Japan) and the SICE (The Society of Instrument & Communication Engineers, Japan), who were official Conference Supporters. The third day of the conference included two panel discussions. The panelists, four in each session, were past IEEE Presidents. They discussed, with audience participation, important issues in the recent history of IEEE. Among the regular sessions was one on the history of organizations for biomedical engineering, and two on technical societies for control systems and automation. Among the speakers in the latter sessions was Hideki Hashimoto of the University of Tokyo, who spoke on the history of the Society of Instrument and Control Engineers (SICE). At lunchtime, there was a multimedia show entitled "Enjoying the Past and Heading for the Future," presented by Charles Alexander and Jim Watson. An afternoon session on power engineering included talks by Sture Eriksson of the Royal Institute of Technology on the power engineering profession in Sweden and by Gilmore Cooke on Fred Stark Pearson and transnational engineering in the early 20th century. In the late afternoon there were two events at the American Philosophical Society Library, located in the historic district of Philadelphia. Roy Goodman, Librarian of the American Philosophical Society (APS), gave an introduction to the rich collection of historical materials in the APS archives. Particularly noteworthy are papers and books from Benjamin Franklin, one of the founders of the APS. There followed a dedication ceremony for an IEEE Milestone, the 1751 book by Benjamin Franklin entitled "Experiments and Observations on Electricity.” A reception followed in the Jefferson Garden of the APS. All together, over the three days of the conference, there were about 90 presenters, and they came from 18 countries on five continents. Many people commented that a great benefit of the conference was seeing friends from around the world and meeting new people, all with a common interest in the history of technology. This page was last edited on 5 January 2012, at 14:35.